Celebrate the holidays in style with a cranberry apple cake! This beautiful and festive cake is filled with cranberry apple pie filling and decorated with cream cheese frosting and sugared cranberries. Growing up, it was my family’s tradition to make cranberry apple pie every year on Thanksgiving. And only on Thanksgiving! Getting to have this dessert just once a year definitely helped make it extra special. But aside from that fact, the sweetness of the apples and the tartness of the cranberries in the pie made for the perfect match. We would serve each slice warm, with a scoop of vanilla bean ice cream, and it was always the part of the meal that I looked forward to the most. Back in those days, there was no such thing as Pinterest. So, the recipe for our cranberry apple pie can be found on a page torn out of one of my grandmother’s favorite housekeeping magazines. We kept it tucked away in our pantry so we could find it each year on Thanksgiving. Of course, I am absolutely obsessed with Pinterest, but there’s something so wonderful about family recipes that are scribbled on index cards, or torn from a magazine and tucked away to be used again and again. Don’t you think? Traditions are such an important part of the holidays, and I always love hearing about how different individuals and families make this time of year special. Being recently(ish) married, I’ve been thinking a lot lately about the traditions my husband and I want to maintain, and how we can put our own twist on them too. The layers in this cranberry apple cake are spiced with a blend of cinnamon, nutmeg, cloves, and allspice. These spices provide an absoultely wonderful aroma and flavor, in addition to the cranberries and apples that are baked into the cake itself. I also wanted to bring in some element of the pie, so I made a simple cranberry apple pie filling to go between each layer. The finishing touches on this cake are a smooth, white cream cheese frosting and a sprinkle of sugared cranberries. I love how they make this cranberry apple cake feel so festive! Even though this recipe was actually inspired by Thanksgiving, I couldn’t help but play lots of Christmas music as I was baking (I know, I know, I started early this year – November 1st). 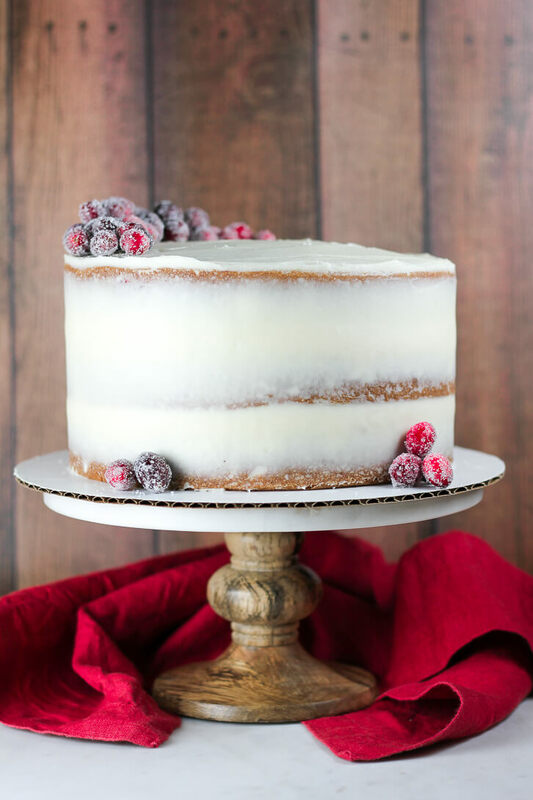 Personally, sugared cranberries remind me of the moment I fell in love with layer cakes, which was when I made a semi-naked gingerbread layer cake topped with sugared cranberries for a friend’s goodbye party. They are beautiful, and surprisingly simple to make. If you’re whipping up a festive cocktail, pie, cheesecake, etc. this holiday season, these cranberries are actually the perfect garnish for a variety of treats. I hope this cake becomes a tried and true family favorite, I know it will be for us! I’d love to hear what other traditions you are keeping or starting this holiday season! Find @flourcoveredapron on Instagram or Facebook and let me know! You’ll find lots more holiday baking inspiration there as well; this week, I’m sharing all my Thanksgiving-worthy cakes with you! This festive cake has three layers of cranberry apple cake with cranberry apple pie filling, cream cheese frosting, and sugared cranberries. Preheat oven to 350 degrees Fahrenheit and line the bottom of three 8-inch cake pans with parchment paper. Then, grease and butter the cake pans. In a medium-size bowl, whisk together the flour, baking powder, baking soda, spices, and salt. In the bowl of a stand mixer, beat together oil and sugar until well incorporated. Add vanilla extract. Then, with mixer on low speed, add eggs one at a time. Alternate adding one third of the flour mixture and one half of the milk, starting and ending with the flour, and mixing until incorporated after each addition. You will have three additions of flour and two additions of milk. Gently fold in apples and cranberries. Divide batter evenly between three cake pans and smooth tops with a spatula. Place cake pans on top of a baking sheet and place in oven. Bake at 350 degrees for 33-37 minutes, or until cakes pass the toothpick test. Remove cakes from oven and let cool in pans for 5-10 minutes. Then, turn each cake out onto a wire rack and allow to cool completely. Combine cranberries, apples, brown sugar, spices, and cornstarch together in a medium size bowl and mix gently with a wooden spoon or rubber spatula. Melt 1 tablespoon of butter in a medium size skillet over medium-low heat. Add fruit mixture to saucepan and cook for 5-8 minutes, until apples are tender and cranberries have broken down. Using an electric mixer, beat together the cream cheese and butter until fluffy and completely incorporated. Add pinch of salt and vanilla extract, then gradually add powdered sugar (about a cup at a time), mixing on low speed until completely incorporated. Chill for about 15 minutes to help frosting thicken up slightly. Heat 1/4 cup sugar and water over medium heat, stirring occasionally until sugar is dissolved. Remove from heat and stir in cranberries until they are coated in the syrup mixture. Once layers are cool, level each cake using a large serrated knife. Place bottom layer on a cake board, using frosting to adhere. Use cream cheese frosting to fill a pastry bag fitted with a large round tip. Pipe a dam around the edge of the bottom layer of cake and fill the center with about half of the cranberry apple pie filling. Spread the filling evenly with an offset spatula or the back of a spoon. Top with the second cake layer and repeat step #2. Top with remaining cake, cut side down. Frost top and sides of cake with remaining cream cheese frosting. Garnish with sugared cranberries. Keep cake chilled. **If making sugared cranberries, start them before or while the cake is baking so they have time to dry before being used to decorate the cake. Such a beautiful cake that you have created, this is stunning in everyway, it´s more like a piece of art! Thanks, Albert! I love baking layer cakes because it combines my love for baking and art. What a beautiful cake! I’m sure that mine won’t be that pretty. Thanks so much Sabine! I’m sure you could make one just as pretty, if not moreso! Plus, sparkling cranberries are such an easy way to make any holiday dessert beautiful! Would love to see a picture of a slice of the cake to see what it looks like on the inside! Hi Ellen, thanks for the question! A variety of apples could work well in this cake! I usually bake with either honeycrisp, gala, or fuji! Oh my, what an amazing looking cake and fantastic photos! This is definitely going on my to-bake list! Hi Cleo, thank you! That’s so exciting, I’d love to hear how it comes out! I made this cake for thanksgiving this year and it was delicious! I wanted a maple flavor in the frosting, but I didn’t have maple extract, so I added a little maple syrup. And while the flavor was nice, I wish I had just left well enough alone because that change made the frosting too sweet in my opinion. Next time I’ll stick to your recipe and/or add maple extract if I want a maple factor. But the cake and the filling were perfect! I’ve never halved a cranberry before – they’re so cute inside! I didn’t halve them for the filling though since I knew they would cook down. Thanks for the delish recipe Haley! Hi Raven! I’m so glad you enjoyed it! 🙂 I love maple frosting too, but I do love the slight tang of a classic cream cheese frosting. Hi Georgia, I haven’t tried it myself, but it should work fine!